Raised by a father who curses the day she was born, Carolena finds herself in the swamps of south Louisiana under the guise of overseeing her father’s investments. In truth, she is making every attempt to avoid forced marriage to any of the men he would have her shipped off to. She’s always believed that her husband would love her, would give his very life just to hold her; not be a man who would marry her to claim her father’s wealth. When she arrives in the deep-south, she catches the eye of a local backwoods family of brothers. The eldest, Bobby, decides that he is deserving of a step-up in life, takes her against her will to his hovel of a home at the edge of the swamps to be shared between himself and his brothers. Carolena — not the shrinking flower they think her to be, flees into the deepest, darkest, wildest portion of the swamps in an effort to escape the brothers and their plans for her. Death at the hands of the creatures in these wetlands is a better option, in her mind. Little does she know, she’s also caught the eye of the most dangerous creature there, one of legend — of nightmares. He’s watching her every move, admiring her bravery — and he’s decided he’s keeping her. Carnage is a Gargoyle. He’s also volatile, dangerous, unpredictable, and lonely. One evening minding his own business at the edge of the sanctuary he calls home, he spies a female. A human female, and she’s running headlong into his swamps, with no regard for her own safety. Then he sees the reason; three men, and they’re hot on her trail, torches in hand, hell bent on catching her before she can get away. He watches as they get closer and closer to her, easily following her trail. Carnage makes a snap decision that changes both their lives forever; he drops out of a tree right behind her, slaps one clawed hand over her mouth to keep her from screaming, wraps her in his huge arms and goes right back to the treetops. He shelters her while the men traverse the ground below, unable to determine why her trail disappeared. Carnage admires this little female — she was brave to run into the swamps alone. There are many creatures lying in wait for just such a meal. But she no longer has to worry about that, because now she’s his. He only hopes that she doesn’t fear him too much once she gets a good look at his blue-grey skin, his fangs and his horns. Because regardless of what she thinks, or the rules of his community — he’s not giving her up. The story line is a bit different and had real potential, but nothing had any depth. The characters are 2 dimensional and the world building lacked detail. I'm not a fan of insta love. 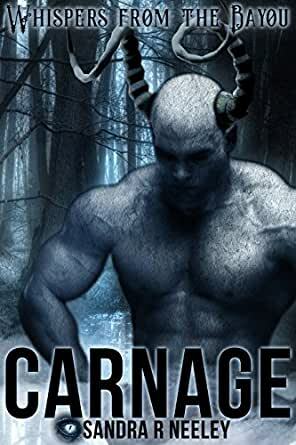 I understood what carnage saw (the only available women) but why Carolena wanted to stay with the grunting gargoyle in the shack in the swamp didn't make sense. I was caught by the blurb and then ensnared by the story. Well written, great character building, some unexpected twists, and love triumphs in the end! Very much enjoyed reading this book, and had trouble putting the book down till I knew the ending. I am not sure what to say about this book, hence the three stars. I liked the concept, gargoyle damsel in distress, swamp, that sort of thing but I felt honestly that the characters let down a good storyline. I still know very little about Carnage, in fact I know more about the secondary players than him. He spent most of his time grunting and chest slapping. Nothing bar his protective instinct gave any insight as to why a seemingly independant woman would fall in love with him in so short a time span. Too many questions left up in the air for me. I have a feeling that this story took alot of ides from the very book the heroine was reading. Was the book a waste of money, no, becaue there was enough in it to make me finish the book, would I try another by the same author? Maybe. 5.0 out of 5 starsMOST CAPTIVATING BOOK!!!!!! 100000000% Recommend, I read this within a day and then kept going back over its amazing. Carnage is just i have no words :O i love him so much i love all of the characters so much. Get on it now and read read read!!! I always love it when I come across an author I have yet to experience and there writing draws me into an exciting fantasy world that I can’t leave till the adventure is complete. Can not wait for the further books in this series. Thank you for such a lovely story. A tale full of pathos, humour and love. A celebration of the difference in all of us. Fun, love, understanding, adventure abound along side the darkness surrounding us all. I look forward to a continuation of tales about the folk of Whisper. 4.0 out of 5 starsswamp monster falls in love with human,quaint tale with hanky panky later in book.